Status: offline There were posters that thought the Vikes would beat the Bears BECAUSE they didn't think much of Lovie's coaching. I think Lovie is a GOOD coach, reserving 'great' for just the coaches that have won SBs. Lovie got the Bears to the SB with Grossman at QB. Lovie's team won the division last year, despite the Pack having way more talent than the Bears. Lovie's teams come to play, and even if you beat them, they'll put some hurt in you. They are agressive for the ball, and have good fundamentals. The Bears beat the Vikes by 29 WITHOUT a bunch of help from the officials. I think the Bears still don't have a true #1 WR, but do have a few #2s. Tice is making the OL serviceable. Cutler improved this year, thanks to improved OL, better play, and Martz. The Bears still have a weak defensive 2ndary. The Bears had a weak team, but filled some of their holes with Cutler and Peppers. Roy Williams and Marion Barber have been slight upgrades. Although many are counting the Bears out of 2nd place with Cutler out, I think Hanie could surprise at times. Although I doubt he has the arm strength of Cutler, I think he is quicker than Cutler. I think, like any QB, he needs a good 10 games experience to work out the kinks, but I think he might not do all that poorly with a decent supporting cast, unless they decide to go and get Orton or FAVRE. Although I don't think the Bears could make a playoff run with Hanie, I think he COULD get them one playoff win, at which time Cutler might be back. Status: offline The Bears are a bit of an enigma. Early last season the o-line couldn't protect Cutler at all, and then later got better. This season started out the same way, and now the o-line gets kudos. I agree that Lovie is a good coach, but not consistently so. But I guess even the really great ones have bad games and make bad decisions. Status: offline It's not a surprise the Bears started out with a poor OL, and with Tice got better last year. I think the same thing happened this year because they really don't have that much talent (not like Dallas early 90s), and Tice brings them together throughout the season and has them playing like a team. They have an even bigger challenge now with Culter out. With Cutler not having a quick release and wanting to throw deep, that puts more pressure on the line. But Cutler did improve this year. With Hanie, the quicker release might make the OL look better at times, just like the Vikes OL looks a little better with Ponder (compared to McNabb). But at the same time, Hanie is inexperienced like Ponder, so there will be plenty of growing pains and mistakes. Status: offline The Bears OLine took a bit too much blame. This was partly due to Cutler back pedaling rather than stepping up in the pocket and Martz's naievity. Kudos to Tice and Martz for adjusting to Cutler who will always back pedal and throw off his back foot to adjust their protection schemes. Hanie is a huge ?. Cutler made so many plays that frankly he is the only one in the NFL that can make those plays tbh. It's difficult when a team has to adjust like that especially when they were clicking. Hanie has been there for awhile and he's Ponderesque in his play, (good mobility, quick release). This might be a blessing for the Bears, perhaps they will get to the playoffs with Cutler healed and fresh to make a run. I must say I susually don't root for division opponents and I've always had disdain for the Bears but I kind of like this version of the Bears. That and my ever growing hatred for the Lions. And they might be the only team to knock off the Pack. Status: offline Either the Chiefs' defense is much better than I thought, or Hanie is not even close to being as good as Ponder. 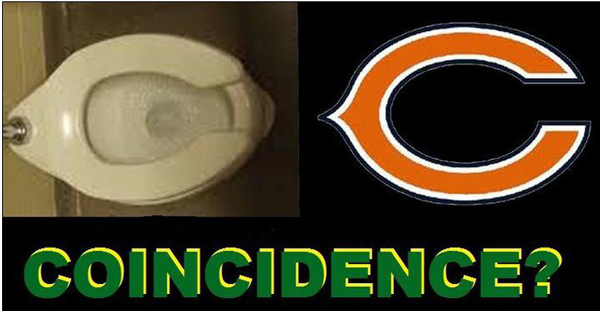 Now I didn't see much of the Bears/Chiefs game, so maybe somebody that saw it can chime in. I'm just wondering if the officials strongly favored the Chiefs with calls and non-calls in this one. I would have guessed with the Bears going into the game being a team with a playoff record, and being competitive at Oakland with Hanie starting the week before, that even with Hanie starting, more money was likely on the Bears to win at home. It'll be interesting next week with Bears at Broncos. The most predictable result is the Broncos winning a close game at home, so even with Broncos minus 3 1/2, I would guess more money would be bet on the Broncos, we'll see if the lines moves to 4. I think either the refs will leave it alone and be unbiased (most likely), or will favor the BEARS if more money was bet on the Broncos. I don't think it's too likely the refs will biased in favor of the Broncos. It COULD happen, as they do have this 'magic' and maybe "God on their side", but I think after they've won a bunch in a row, it might get too predictable and too many gamblers might win betting on them, so the refs favor the other team towards the end. The NFL just doesn't want things getting too predictable. But I really think the refs will leave this one alone, and the most likely result is Denver winning a close game. OTOH, with Hanie not being able to give his team a TD at home against the Chiefs, he might really run into trouble at Denver with the Dawkin's 2ndary, and end up throwing a bunch of picks which might get returned for TDs. I sure wouldn't feel all that safe putting money on the Bears. The smartest thing is to just not bet this game as you can't really count on the officials 'swaying' the game. If I had a little extra money, I might put a small amount on Denver covering the 3 1/2, as the odds would seem to favor that (and moreso with Forte out). Status: offline I will be all over the Bears +3.5 and the Under. The Bears D won't give up more than 13 points. Hanie was bad but he did put the game tying TD right on Roy williams who bobbled it right into a Chief DB for the game ending pick. Hanie was poor and there's no way I'd take him over Ponder, but I thought he had a similar skill set. Status: offline Bears covered the 3 1/2, did anybody see the game ? If so, I was wondering did the refs help put the Bears in a position to cover that ? Or did they just leave the game alone, appearing to call it without bias ? Or, did the least likely thing occur, that being heavy favoritism by the refs for the Broncos, but with great play, the Bears overcame that, and made it a close game ? All I know is the Bears got Tebow'd! Bears will likely get their passing game going, and will be hard to beat. Although, it always seems like teams that switch HCs, going from a defensive guy to an offensive guy, a lot of times their offense gets better, but their defense goes bad. I always think whatever your HC's background, you should try to get a coordinator for the other side of the ball that is very good, one that is likely to be considered a HC soon down the road. I'm not really sure what the Bears now have DC with Mel Tucker. Do you think Musgrave will be wanted for a HC soon by other teams ? Status: offline I hate to say it - but I wish WE had a 1985 to keep going back to. Status: offline I guess we now know "The Secret to Seattle's Success". Status: offline This is a surprise? Their head coach bailed out of USC right when they were about to be sanctioned for rules violations by the NCAA. Do you think he cares about playing inside the rules? I wouldn't be surprised if half the team is jacked up. Status: offline It's early and a lot could change, but with their 0-3 start, injuries and upcoming schedule, 2 to 3 wins might be the upper limit for this team. Status: offline Any chance the Bears could be less horrible than the 4th quarter against the Jags on Thursday? I think if they play the Packers like they played the Jags in the first half, the whole game, GB could go reeling. Anyway Brett Farve stayed in town to be at this game? One of the two days a year I pull for them.